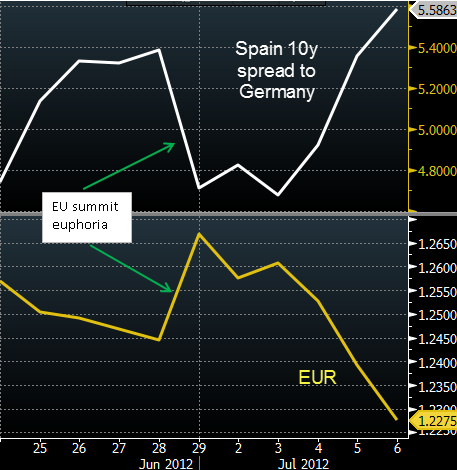 As discussed last week, the market "euphoria" associated with the outcome of the EU summit was premature. Once the practical realities of what was actually accomplished sunk in, a great deal of the risk asset rally was reversed. Even the relatively simple agreement to hand over Eurozone-wide bank regulation to the ECB turns out to be not so simple. WSJ: - Some officials in the European Commission—the EU executive that will be an important architect of the plan—and some national banking authorities, have their doubts about concentrating this power in the ECB, said Mujtaba Rahman, an analyst with Eurasia Group in New York. Even ECB officials don't have a common position on whether bank supervision is an appropriate role for the central bank. The effort of recapitalizing Spain's banks has been stalled because no central mechanism currently exists to perform such a recapitalization. The ESM was designed to provide lending to governments, not make equity investments in banks. Plus the ESM is not even fully set up yet. WSJ: - The trickiest questions surround the plan to directly recapitalize banks. The issue is how to convert a fund created by governments to provide loans to other governments into one that may also provide equity finance for banks. One idea officials say was discussed at the summit—the possibility of quickly creating a special entity to stand between the bailout funds and the banks that would absorb losses on the investment—was dismissed as being unacceptable to Germany and others. And all that talk about the ESM being empowered to buy sovereign bonds in the secondary market was, well, just big talk. Not only would a nation need to apply for this "bailout" buying program and not only would Germany be able to overrule this action, but now the ECB will need to give its approval as well. This is European bureaucracy at its best. Bloomberg: - The European Central Bank will need to recommend that that the euro region’s rescue fund buys a country’s bonds before securities can be purchased, European Union Economic and Monetary Affairs Commissioner Olli Rehn told the newspaper Corriere della Sera. Once a country requests that the fund buys its bonds to try to bring down borrowing costs, granting permission “will depend on the analysis of the recommendations of the ECB and other conditions,” Rehn told the Italian newspaper in an interview.